This book is not an easy read. 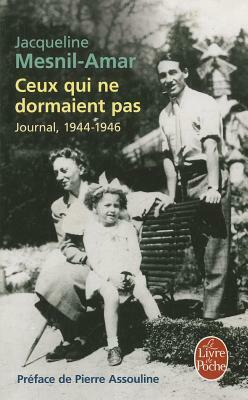 It is a diary held by the author during summer 1944 while her husband had been arrested by the Nazis and their French cronies. This was the last moment of the war, and the Resistance, together with the American and British forces were advancing towards Paris to free the city from the invaders. But Jews were still being sent to concentration camps, resistance fighters were still arrested and tortured and killed. In this diary, Jacqueline pines for her missing husband, she is mad with anxiety and grief and every day fears that someone will tell her that he’s dead. It made me think of La Douleur by Marguerite Duras. Duras’ anguish is more literary, more impactful because of her style, but Jacqueline Mesnil-Amar’s is no less sincere. All around her Parisians are catching their breath and their hope get stronger by the day that they soon will be free, but the city is full of wild rumors that Germans want to burn the city down before leaving. It is a limbo period both for the author and the city, and she vividly captures the atmosphere. As she walks all over the city (no fuel for cars anymore) to meet with friends and gather news about her husband, she passes by old places and remembers her happiness with her husband before the war. The biggest difference with Duras’ book is that Jacqueline Mesnil-Amar was Jewish, as was her husband and their 10 year old daughter. They had survived the war by going into hiding and assuming false identities, moving from place to place everytime their hiding place was threatened. Family members had been arrested and sent to death in extermination camps, and she’s very aware of the dangers she and her daughter, as well as her own ageing parents still face in the last days of the war. Like Duras, she has tried to ask well-connected friends for favors to save her husband and her family. Unsuccessfully. She bemoans old friends’ lack of courage, their compromises with the enemy and their indifference at the persecutions against Jews, especially children. She is bitter and angry because she feels betrayed by almost everyone, and also by her own old delusions of safety. She had grown up in a wealthy French assimilated Jewish family, where people believed that Antisemitism would not affect them, only poorer and less assimilated immigrants from Eastern Europe. But in the end, Nazis made no difference in treatment, and French people turned their backs against them. As always in Persephone delightful and thoughtful editions, a very rich and informative preface adds to the reading experience by filling the gaps, and the diary itself is followed by articles that Mesnil-Amar wrote later to appeal for the Jewish orphans of the war. We learn how the author was involved after the war in Jewish help organizations and how her Jewish identity took precedence over her French identity that had disappointed her so much. It is a very moving book that would be a perfect companion to Helene Berr’s diary (the two women knew each other, as I understand), who was not so lucky.